The White Wolf townhomes for sale are a tight cluster of single-family homes built in the late nineteen-nineties on Ski Hill Road with the Breckenridge Nordic Ski Center as its backyard. The free shuttle bus stops nearby and will conveniently convey residents one-half mile to the base of Peak 8, or downtown Breckenridge. Set on a small – 1/20th of an acre – lot, any White Wolf home for sale with have low yard maintenance, yet offer three or four bedrooms and well-planned living areas that offer enough square footage for full-time residents or large seasonal groups. Read more about townhouse living in this Breckenridge community, or check out the active White Wolf townhouse listings below. 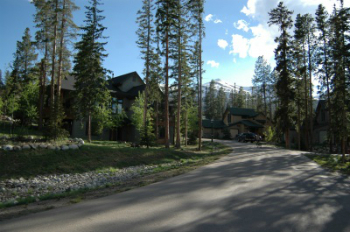 White Wolf Townhomes are located on Shock Hill, which is a small plateau above the town of Breckenridge and the base of the Peak 8 of the Breckenridge Ski Resort. The area has been developed with high-end homes with reserves for wildlife and open space. White Wolf is a less-expensive way to own a home on prestigious Shock Hill, which is close to both the lifts and downtown. From White Wolf, groomed cross-country ski trails are just outside the door, on-mountain skiing up the road and town just a bus ride away. In the summer, trails radiate from the area to national forest, and some, including a paved sidewalk lead to town. The Cucumber Gulch Wildlife Preserve is nearby White Wolf, and offers a setting with streams, wetlands and wildlife. Size: 1664 sq. ft to 2098 sq. ft.
From the traffic circle on the north side take Park Ave take a right - or from Main Street Breckenridge, go west - on Ski Hill Road, continue one half mile to Settlers Drive and turn right into the While Wolf subdivision. Are you curious about the townhouses for sale in White Wolf? An expert from Breckenridge Associates is waiting to talk to you. Contact us today.